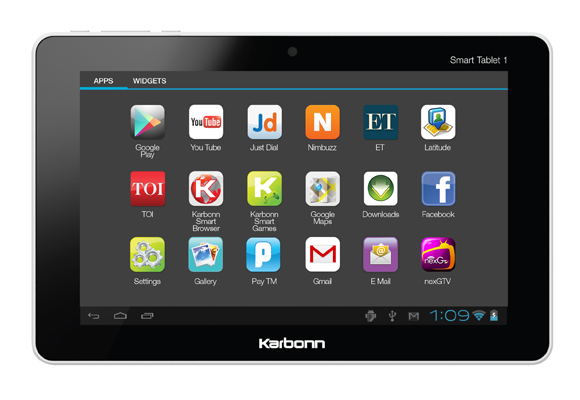 Karbonn launches pocket friendly tablet with Android Jelly Bean OS. Karbonn a market player in mobile phones, is leading the race when it comes to tablets. This time Karbonn has brought Karbonn Smart Tab 1 which is a low-cost tablet with most of the best features at its best price of 6990/-. This is the only tablet which is the most updated among all others in this price segment. Karbonn Smart Tab 1 is integrated with Jelly Bean OS(Operating System) with the latest Android version. This tablet is powered by JZ4770 SoC processor which is 1.2Ghz to get optimized performance. It has a 17.8cm screen which supports capacitive touch. Karbonn Smart Tab 1 has a 2 megapixel front facing camera. Since it is Android based tablet it supports a most of the multimedia formats like AVI, VOB, MPEG, MP4, MP3, 3GP, FLV and WMV. The tablet has 1GB internal storage and 32GB expandable memory storage. Related Post: Nokia Lumia 800 – A Review. 3,700 mAh battery to power upto 7hrs of Internet browsing. 1GB internal storage and 32 GB expandable space. USB connectivity and calling not available. Related Post: Deep focus on new – Sony Cyber-shot DSC HX9V. Pre-booking is available from Karbonn site or you are in urgent need of it can directly get it from Flipkart. « How to calculate your hosting server downtime and uptime?